When the Chicago Bears kick off their Training Camp on July 16, optimism for what’s to come in the 2018 season should be nearing all-time highs for Bears fans. Head coach Matt Nagy will run his first training camp as just that, a head coach, after joining the Bears from the Kansas City Chiefs where he stood as the team’s offensive coordinator for the past two seasons. All Nagy did in Kansas City was transform former Chiefs QB Alex Smith into a true downfield threat as Smith held the league’s highest passer rating on deep passes (20-plus yards) last season. Nagy enters the fold with second-year quarterback and former No. 2 overall pick, Mitchell Trubisky firmed planted as his signal-caller. 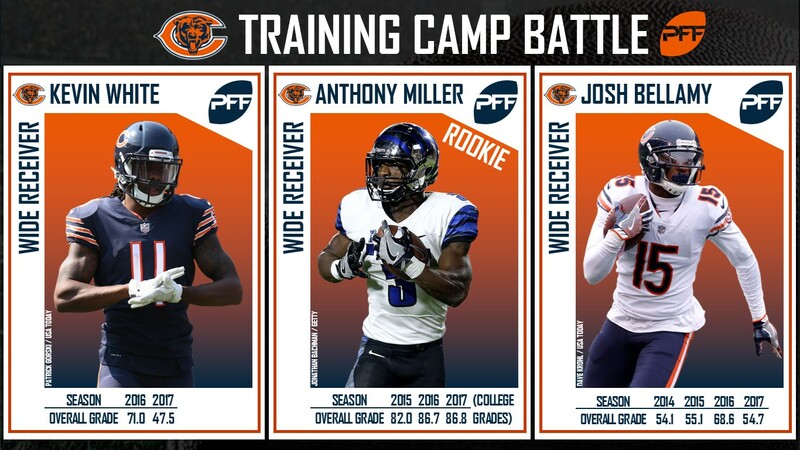 While I recently mentioned him as a first-year head coach set to make an impact and our Senior Analyst Mike Renner took a look at what Nagy’s impact can be on his young quarterback, training camp for the Chicago Bears can give other insight into what the Monsters of the Midway may look like in 2018. While there are several developing storylines for the Bears as they hit the practice field, the cast of receivers on the end of Trubisky passes is arguably one of the most intriguing. Chicago signed Allen Robinson and Taylor Gabriel and drafted Anthony Miller out of Memphis to completely revamp, seemingly their top three options at receiver. Robinson is two years removed from his best season as a pro, a season in which he led the league in deep receiving yards (672 in 2015) but only played three snaps in 2017. Gabriel played behind both Julio Jones and Mohamed Sanu in Atlanta last year, yet ran only 15.2 percent of his routes from the slot receiver position. Gabriel was targeted eight times on deep passes last season and did not haul in a single one of them as all eight were deemed uncatchable. His outside presence will have to expand as Robinson is the team’s likely No. 1 wide receiver. If he does utilize his skillset to become a viable option on the outside for Chicago, this should allow the Bears the flexibility to keep Miller inside in the slot, a place where he shined at Memphis last season. He turned 50 slot targets into 37 receptions, 546 yards and eight touchdowns for the draft class’ third-ranked yards per route run figure of 3.43. Miller’s eight touchdowns from the slot tied him for fifth among all 2018 NFL Draft receivers. 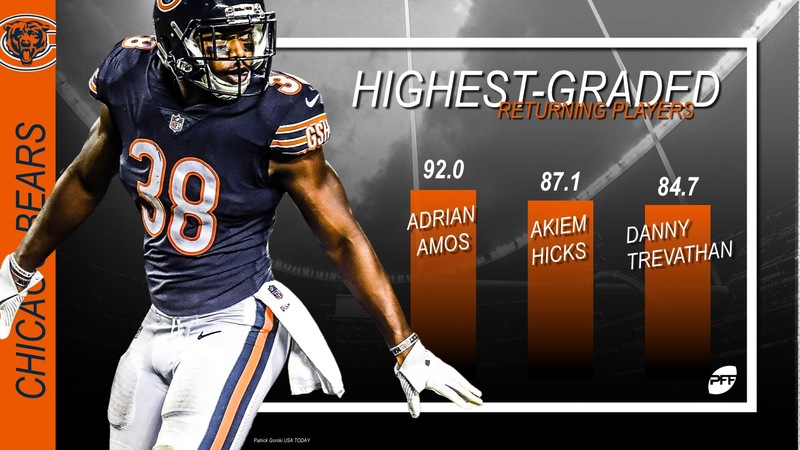 He’ll likely have to do just enough during training camp to beat out the oft-injured Kevin White and Josh Bellamy, something someone with Miller’s skillset seems likely to be able to do. While this could be seen as a position battle, and it likely will be such, with the value of the slot receiver on the rise, the Bears may be best suited to allow Miller to stay inside if he can outperform White and Bellamy and have Gabriel and Robinson on the outside. Add in the optimism for White’s healthy return as a complementary receiver and Trey Burton hauling in passes at tight end, Miller staying in the slot is that much more appetizing for 2018. The Bears drafted the new face of their defense when they nabbed Roquan Smith with the eighth overall pick, selecting the former Georgia linebacker to lead their defense. Smith is the perfect linebacker for today’s NFL, possessing the speed to cover sideline-to-sideline while also holding the strength to stop the run and the quicks to defend the pass. Smith racked up 45 run stops (eighth in the class) and allowed just 0.56 yards per snap he spent in coverage (17th-lowest total among Power-5 draft class linebackers). Who is joining Smith in the Chicago linebacking corps is the real question. 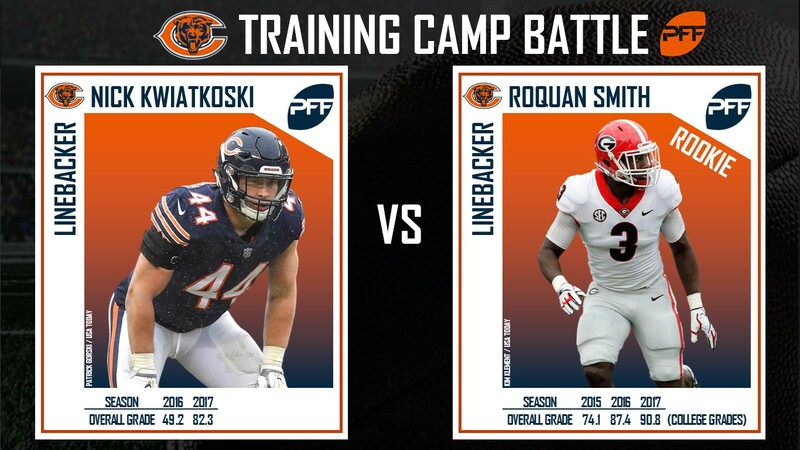 Nick Kwiatkoski seemingly had the position locked up after a strong sophomore year, but now may be limited to a rotational role as Danny Trevathan and Smith have likely locked up the two inside linebacking spots for the Bears. Kwiatkoski was solid in run defense last season, bringing down 15 run stops without missing a single tackle against the run and his prowess on short-yardage downs may prove vital for the Bears in 2018. At outside linebacker, Sam Acho and Leonard Floyd are poised to be the starters but for the first time in what seems to be a long time, the Bears will have plenty of depth at both linebacker positions. Aaron Lynch was signed from the San Francisco 49ers and his passing down pass-rushing should pay dividends. Jonathan Anderson and John Timu are veterans who may find themselves sliding on the depth chart as Nagy and general manager Ryan Pace doubled down on linebacker by drafting Joel Iyiegbuniwe from Western Kentucky after drafting Smith. Iyiegbuniwe brought in 18 pressures on just 94 pass-rush snaps last year and led the Hilltoppers with 51 defensive stops. Josh Woods is an undrafted signing from Maryland who is projected as a converted hybrid linebacker. Woods brought in 14 defensive stops from his safety position last season and recorded two interceptions and four pass breakups on just 26 targets. Chicago’s training camp will start with plenty of optimism as stated above as for the first time in years, depth issues that plagued the Bears have been addressed. This is not to say there are not other issues that are still in need of addressing but that’s what training camp is for. Nagy built the Chiefs into a real threat on offense and with his guidance over his young quarterback, who shined in the first quarters last season, the sky is seemingly the limit for this young team.